Rugged and dramatically beautiful with plenty of really good secluded beaches. The island has not given itself over to mass tourism to the same degree as many of its neighbours, but Karpathos Town has a busy waterfront with plenty of cafes and restaurants. Karpathos is an island full of tradition history and culture. Greek Mythology Has Karpathos island as the home of the Titans as well as Prometheus who gave the gift of fire to the mortals. Karpathos island situated in the Dodecanese twelve islands group of Greek islands, is an impressively elongated island, 49 kilometers in length and 11 kilometers wide. In the middle of the island the width does not go over 3 kilometers ! The highest mountain of Karpathos is Kali Limni at just over 1,200 meters in height. Pigadia, Diafani and Olymbos Village full of tradition are very much worth visiting. 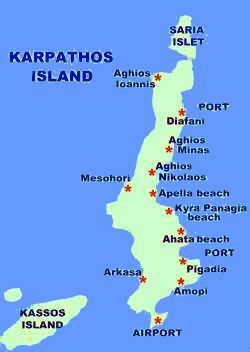 In Karpathos there are also many beaches one can discover and may other places to explore.